For a fresh, new look at flooring, choose versatile Marmoleum in Seattle, WA. With this special type of linoleum, you have a multitude of design options for your home or business. Choose bold colors or striking stripes for flooring that makes a statement, opt for natural appeal with the look of wood or marble, or select more subtle patterns that complement your space. With more than 300 colors and 12 different design structures, this flooring surface offers you endless possibilities for decorating. Speak to our sales and design specialists who are happy to help you navigate the world of Marmoleum. Our professionals ask you questions about where you would use Marmoleum, as well as your design and color preferences, to find the flooring that best matches your requirements. Come into our flooring showroom to see and touch the Marmoleum and visualize how well this flooring fits into your home or business. Marmoleum is made using natural raw materials, such as linseed oil, wood flour, and jute, as well as recycled content. Bio-based and sustainable, Marmoleum is the ideal green flooring option for residential or commercial use. Marmoleum is a great addition for your home office or in a formal living-room setting. This flooring option is prized for its ease of maintenance. 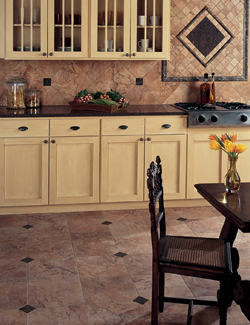 This flooring material has a special finish that protects it against stains, soil, scratches, and scuffs. Made to withstand daily wear and tear and always look beautiful, Marmoleum flooring offers long-lasting durability. The manufacturing process for Marmoleum ensures that it is an eco-friendly material. The manufacturers of this product utilize the Life Cycle Assessment methodology to increase efficiency, reduce the use of raw materials, and research environmentally appropriate solutions. Their factories are clean, efficient, and powered by renewable energy, and they are continuously researching new ways to minimize their negative effect on the environment. Marmoleum is not only safe to use in your home – it’s also safe for the environment overall. Our most popular types of Marmoleum include sheet flooring and modular tiles, both of which can be installed by our skilled technicians. Marmoleum sheet flooring is widely used in a variety of settings including healthcare centers, educational buildings, commercial offices, restaurants, retail stores, industrial settings, and government buildings. Because it is a single continuous piece, Marmoleum is watertight and easy to clean. There’s no chance that water will seep through cracks to the subfloor, where it can contribute to mold or mildew growth. While Marmoleum is already popular in commercial and medical settings, it can also be incredibly versatile in residential settings. Marmoleum modular tiles and sheet flooring is available in a huge variety of patterns, solid colors, and stone-look appearances. Whether you’re looking for a brightly colored, water resistant, and easy to clean surface for a child’s playroom or a more subtle but still easy to maintain floor for your master bathroom, Marmoleum is sure to suit your needs. Marmoleum flooring is easy to take care of, making it perfect for homes with busy families, retail stores, medical locations, and any location that experiences a lot of foot traffic and activity. To keep your Marmoleum looking clean and new, simply sweep any dirt or dust daily and use a cleaning solution with a neutral pH level. There are a variety of Marmoleum-specific cleaners that may be used with an automatic scrubber, wet mop, or wet vacuum. Ensure that your flooring gets the best start to a long life with our professional flooring installation. On staff at our flooring store are experts who know the best practices and processes for installing your new Marmoleum. They make sure the subfloor is prepared properly so the sheets and tiles adhere correctly and remain secure, despite heavy use. The professionals at our local flooring store want you to be happy with your new Marmoleum. That is why we offer the industry’s strongest guarantees on all of our flooring products, as well as Marmoleum installation. By leaving your Marmoleum installation to our experts, you’re also covered by our Lifetime Installation Guarantee. Available for select, star-rated flooring products, this guarantee ensures that if you ever experience an installation-related issue with any flooring installed by our specialists, we’ll make it right at no expense to you. Your vibrant new floors are sure to last for many long years with proper installation and regular maintenance. Visit our flooring showroom, use the contact form on this page, or call us today at to find out more about Marmoleum. We proudly serve clients throughout Seattle, Bellevue, Bothell, Edmonds, and Issaquah, Washington.